The Crow, written and drawn by James O’Barr, is one of my favourite comics of all time. It’s a thing of beauty, dark beauty, and stays with you for a long time after reading. The 1994 film adaptation, staring Brandon Lee as The Crow, is definitely an all time classic film. It captured the spirit of the comic. The tradgic on set death of Brandon Lee, killed when a stunt involving blank bullets went horribly wrong, only added to the mystique of the movie. It was a swansong of a man cut down in his prime. Now with a film that well recieved you’d think that, in the height of the 16bit era, a tie in game would be inevitiable. You’d be wrong. Fast forward to 1996 and quasi sequel film The Crow: City of Angels was released. And it was a stinker with zero redeeming features apart from possible the soundtrack. Like the first film it featured a lot of underground punk and new wave music that I really loved. It was this piece of crap film, that literally took everything that was good about the first film and ignored it, that was licenced in to a game. The Crow: City of Angels was released on Sega Saturn, Sony Playstation, and The PC in 1997. The box promised that it was 3D Fighting with a vengence. It sounded promising however… It was a truly awful game. I first played the PC version of this I picked up sometime around 1998 or 1999 from a bargain bin for something like 50p. I went in with low expectations but somehow I still came away feeling massively disappointed in the experience. Do not adjust your device. It really did look this bad. So what went wrong? Well firstly there was the graphics. Much like the early Resident Evil games they saw 3D polygon characters placed on the top of 2D rendered backgrounds where the idea is to give the illusion of full 3D. When done well it’s a great idea. This game however didn’t do it well at all. The first issue was the severely low polygon count in the character models. They kind of looked like who they were meant to if you squinted a lot. The PS1 and Saturn weren’t the most powerful systems in the world but both were capable of far better graphics than this. The backdrops were bland and plain and looked like they were done using the game engine anyways. Another really annoying aspect was the camera angle changes. Having the backgrounds pre-rendered the background and camera angle would change depending where you were in the room. However these changes seemed to occur purely at random and had zero relation to where you were in the room. They also had a nasty habit of changing leaving your character outside of the field of view thus making the game infuriatingly difficult. The difficulty was confounded by the controls. God they were bad. Firstly you used the dPad to move. You pressed up to make your character walk whichever way he was facing, down to make him walk backwards, and left and right made him spin around on the spot. It was a fight making him walk in a straight line. Never mind actually getting to the fights themselves. The first few levels were a case of crude button bashing and hoping for the best. It felt like you were fighting the random camera angle changes as much as you were the baddies. You could get through them though if you had patience. Then a few levels in you gained access to guns so you could blow the baddies away. The problem was you had a shotgun, almost zero ammo, and every 3 shots you needed to reload which took about 5-10 seconds. And even the most basic of baddies took at least 7 shots to kill. Oh and by this point the baddies were all given machine guns that would kill you in about 2-3 hits. And they could fire 30 shots a second. You just could not get past this point. The jump in difficulty is insane. It’s like if you were learning to swim and you got your five meter badge. Then someone comes up to you, kidnaps you, and drops you in to the middle of the Atlantic telling you it’s fine. You can swim now. You’ll be at land before you know it. It’s crazy. Another bad aspect was the sounds. The music of the films, even the ever worse straight to DVD sequels, was always a high point. The game could surely feature some CD quality audio couldn’t it? Erm… Nope. The entire game had a five second drum beat with faux guitar looped throughout it. It sounded like a particularly bad NES game. 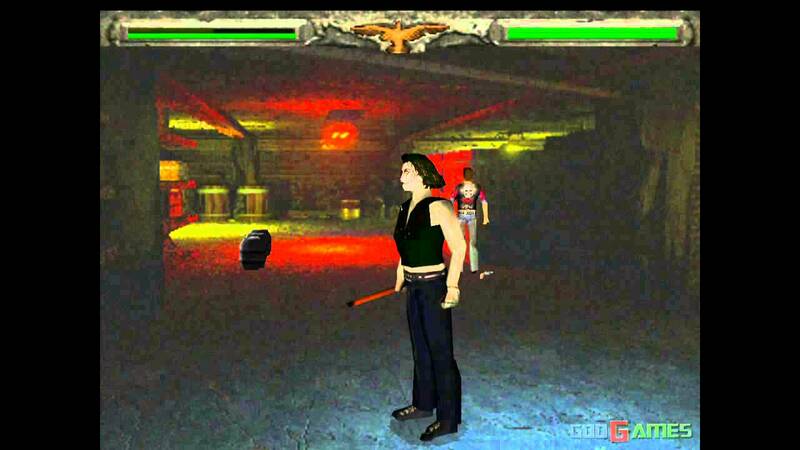 It’s perhaps also worth noting that this was the only time that The Crow ventured in to videogames. It bombed that bad the licence holders vowed never again.